John A. Sprunger, a Mennonite (General Conference Mennonite) evangelist and publisher, was born 12 August 1852 in Münsterberg, Switzerland, a son of Abraham B. and Elizabeth (Zürcher) Sprunger. In 1854 the family came to America and settled in Adams County, Indiana, in what is now Berne. His formal education consisted of several winter terms in the district school and a short term in the Mennonite school at Wadsworth, Ohio. He was eager to learn and had a good working knowledge of both English and German. As a young man he took active part in church activities, but his interests were rather centered on business affairs. In fact, he became the outstanding early promoter of Berne. He originated or took a prominent part in more business enterprises and built more homes in Berne than any other man, and became wealthy. On 15 February 1880, he married Katharine, a daughter of Peter and Elizabeth (Sprunger) Sprunger. Katharine faithfully and whole-heartedly supported him in all areas of their ministry. In 1888, after the death of his only daughter, Sprunger resolved to devote his life to Christian work, and devoted his considerable wealth to the cause of Christ. He conducted a few home mission tours in this country. 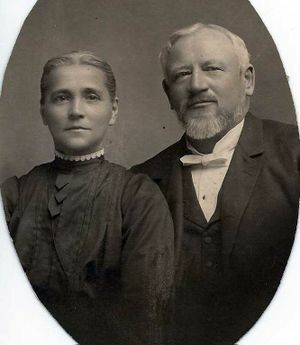 Then he and his wife spent about a year (1889) in Switzerland in successful evangelism, which led to a permanent revival, especially among the Jura Mennonite churches starting at Kehr near Langan. While there he was ordained to the ministry. Sprunger founded the Light and Hope Missionary Society in 1893, which established the Light and Hope Orphanage in Berne on 1 April 1893. Sprunger also established a deaconess training school in connection with the missionary society, and made the orphanage the headquarters of all these activities. About 1898 he established the Light and Hope Publishing Company at Berne, which published the monthly journal Licht und Hoffnung, started in 1893, and its English counterpart Light and Hope. Among the workers in the print shop and orphanage in Berne were William Egle, H. C. Bartel, and John Horsch. Sprunger was strongly influenced by the Christian and Missionary Alliance. Although he worked very closely with the founders of the Missionary Church Association for a time, he never fully joined the group. He was the founding pastor of what is now First Missionary Church of Berne. In 1902 Sprunger moved the orphanage, print shop, and publishing company to Cleveland, Ohio, and soon to Birmingham near Cleveland. Here H. J. Dyck joined the group of workers. Here also Sprunger died 28 September 1911. He was buried at Berne, where his cousin S. F. Sprunger preached the funeral sermon. He was the author of several books, including a 2-volume work, The Gospel in Types, and Outline of Prophecy, and in German, Ein Blick in die prophetische Zukunft (Berne, circa 1900), Leben und volle Genüge (Berne, no date indicated), and Volles Heil (Berne, no date indicated). With H. J. Dyck he edited two hymnals: Himmels-Harfe für Sonntag-Schulen, Jugend vereine und Evangelisations-Versammlungen (Birmingham, Ohio, circa 1907), and Lieder-Auswahl aus Himmels-Harfe (Birmingham, circa 1907). Bender, Harold S. and Max Haines. "Sprunger, John A. (1852-1911)." Global Anabaptist Mennonite Encyclopedia Online. October 2018. Web. 21 Apr 2019. http://gameo.org/index.php?title=Sprunger,_John_A._(1852-1911)&oldid=162233. Bender, Harold S. and Max Haines. (October 2018). Sprunger, John A. (1852-1911). Global Anabaptist Mennonite Encyclopedia Online. Retrieved 21 April 2019, from http://gameo.org/index.php?title=Sprunger,_John_A._(1852-1911)&oldid=162233. Adapted by permission of Herald Press, Harrisonburg, Virginia, from Mennonite Encyclopedia, Vol. 4, p. 605. All rights reserved. This page was last modified on 22 October 2018, at 12:33.